Whatever your age or skin type, Chloro Plasma and Blue Plasma deliver extraordinary results! While I wouldn’t say an early 20-something needs to invest in plasma-based products, once you hit your late twenties, it’s time to incorporate Perricone MD’s plasma products into your skincare routine. 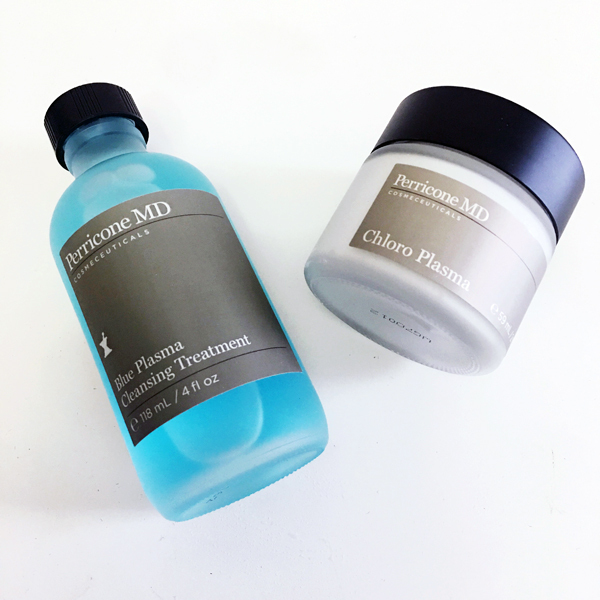 If you’re apprehesive about switching your ENTIRE skincare routine to anti-aging products, start gradually with Perricone MD’s Blue Plasma Cleansing Treatment and Chloro Plasma Purifying Mask. Perricone MD Blue Plasma Cleansing Treatment is a non-rinse formula that deeply cleanses makeup and skin-aging debris as it gently exfoliates and conditions, leaving an instantly smooth and radiant appearance. Paired with Micellar molecules, this gentle cleanser works to trap skin pollutants, unclog impurities from deep within pores and allows for optimal delivery of Dr. Perricone’s anti-aging ingredients. While the instructions call for morning and evening use, I prefer to use it only in the morning when I don’t have a full face of makeup. Perricone MD’s Chloro Plasma Purifying Mask is an anti-aging face mask that deeply purifies and detoxes skin. It is formulated with innovative Phytonutrient-enriched Microcapsules including blue green algae and watercress. Abundant in chlorophyll, these phytonutrients deliver deep detoxification and purification benefits while smoothing the appearance of wrinkles and dramatically minimizing the appearance of pores. The mask starts as a gel and then transforms to green clay, which is best left on 5-10 minutes and used 2-3x/week.